Zach and I go on his Cub Scout camping trip. 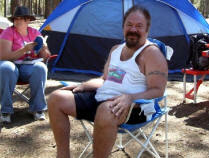 We're back from camping at Bear Canyon Lake up on the Mogollon Rim, a little northeast of Payson. By "we" I mean me, my grandson Zachary, and some 15 other Cub Scouts and their parents and families. And other than a little car trouble, the weekend went perfectly. Some of the parents were able to take Friday off and get there early. I wasn't one of them. In fact, after getting off work I had to pack and shop for the trip. Michael had assisted Zach in getting his stuff ready. But I still had to buy food and pack the tent and sleeping bags and stuff. So it was 8 pm before we were on our way. I had previously gotten the latitude and longitude of the (probable) campsite by following the directions on Google Earth, and they'd been fed into the GPS. Still, it was disconcerting to realize I'd forgotten to bring the actual directions. But the Cub Scout leaders promised signs pointing the way, and I wasn't turning back now. Zach's friend, Lane, was originally slated to accompany us. I asked why that had changed, and Zach explained Lane had gotten an ear infection at his birthday party last week. "But I don't mind," Zach added. "It's funner when it's just you and me." There are times when one doesn't correct a child's grammar. "I think so, too," I agreed. The map in my GPS is a little out of date. That became obvious when, along new stretches of the recently-reconstructed Beeline Highway, the GPS indicated we weren't even on the road, and kept urgently suggesting we "Turn left!" to get back on it. Of course, I should have seen this coming, given that it refers to the state in which we live as the "Arizona Territory". It was 10:30 pm when we reached the top of the Rim and the intersection with Forest Road 300. This was the same road on which we'd played in the snow just three months ago. Then, the road was impassable. Now, though unpaved, the road was smoothly graded. Also known as the Rim Road, Forest Road 300 provided infrequent glimpses of car lights in the valley 4000 feet below us. We were following a couple of trucks, each of which threw up an enormous plume of dust. I had to change to Max AC to avoid drawing all that dust into the cabin of the Expedition. After nearly an hour of this (and with the GPS frequently thinking we were off the road entirely so that we had to follow actual signs to Bear Canyon Lake), we found ourselves at our destination, a large area set aside for camping. We drove around the area but weren't certain we'd spotted Pack 380. So, given that it was now about 11:30 pm, we decided to pitch our tent wherever, and to locate the pack in the morning. We found a spot apart from everyone else. Just as we arrived, the Expedition stalled. This was new, unexpected and unwanted behavior on its part. I was able to restart it, so I parked, crossing my fingers there would be no trouble in the morning. We had brought Zach's new tent but, given that it was so late and I would have to pitch it in the dark, we elected to use my old, familiar tent instead. In just a few minutes, despite the temperature of 53°, we were nestled cozily in a bed of sleeping bags and comforters atop an excellent air mattress. Zach even had a few of his favorite bed animals. During the night, the temperature dropped even further but we never noticed. In the morning, Zach awoke and looked out the tent window and gasped. "It's so beautiful!" he exclaimed. "How did the trees get so tall?" We struck camp and got in the car…which wouldn't start. Instantly my brain started running through options. Given that there was no cell phone service so far in the woods, they all seemed to involved walking long distances. Finally, and in extreme desperation, I opened the hood. I know as much about car engines as Brittney Spears knows about propriety. But I thought, maybe, all the dust from the night before had clogged the air filter. So I opened the cover for it. However, the air filter looked perfectly clean—almost new, in fact. I re-latched the cover, closed the hood, and returned to my car seat. Then, uselessly because I had done nothing that could have changed the way the engine worked, I turned the key. It turned out we were camped only a hundred yards or so from the Pack 380 site. In fact, they had spotted us the night before, and began yelling "Pack 380! Pack 380!" but because our windows were closed and we had the stereo on, we never heard them. I found a nice level spot across from Zach's den leader's tent, and re-pitched the tent there while Zach joined his pals. The camp was in a large area, maybe two or three acres, cleared of underbrush and beneath towering Ponderosa pines with the occasional cluster of birch. As I said hello to Christa, the den leader, I realized I had parked directly beneath a pine that had fallen, presumably some years past, against two other trees that still supported it in rather precarious fashion. It had clearly been that way for some time, and wouldn't likely budge until the next winter storm at least; so I crossed my fingers, remembered that the car insurance was paid up, and left things as they were. A number of kids had already left on a hike to the lake itself, so Zach and I decided to go on our own. If we met up with the other kids, okay; if not, that was okay as well. The first half-mile or so of the "trail" was, in fact, a road to a parking lot. If I hadn't been afraid the car wouldn't start again, I might have driven it as several of the other parents did. But I'm glad we walked. 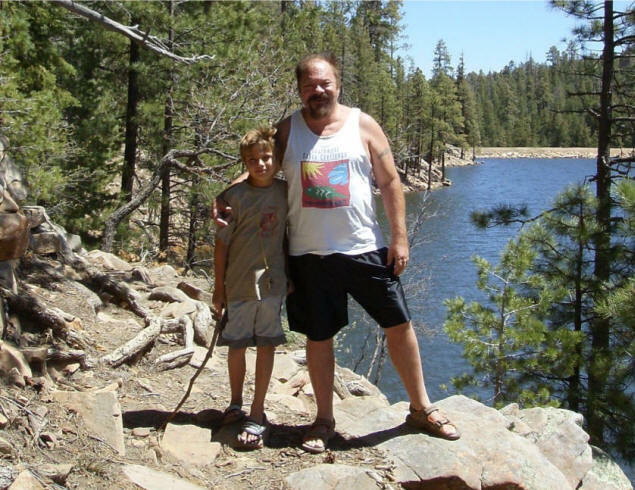 Zachary again admired the trees, wanted to know why the road wasn't paved, why the Bear Canyon Lake camping ground wasn't closer to the lake, and other aged-9-appropriate questions. A well-maintained trail led to the lake. Tantalizing views of the lake peeked through the pines. In the photo above, you can just make out the dam that creates this lake. It's a simple earthen dam; there's no sign of electric power generation or even control; so the purpose of the dam must have been simply to create this lake. At one point along the shore trail we came upon some logs floating in the water. Zach played on them for at least half-an-hour. Back at camp, the kids played a little flag football. I let Zach take the camera for a bit and take shots of anything that interested him. Thank God for digital cameras and 1gb memory chips! Papa, happy to veg in the sunshine. Zach's friend Sam earning his whittling chip. Self-portrait: A Cilwa male tradition. How many roads must a boy walk down to get his feet this black? Then there were water balloon fights. An early dinner (we had hot dogs cooked over an open fire, of course) was followed by that camp favorite, caramelized marshmallows. Before the official campfire, the kids were led on a scavenger hunt (a number of parents joined in) in which the players had to find "reflective objects" and write down what they were. The leaders had previously seeded the woods with numbers on reflective backgrounds that would make them stand out at night if a flashlight were aimed at them. An object was tied to each reflector. The kids spent about a half hour finding the objects. Zach's group came in fourth, partly because they were having too much fun shining flashlights at each others' faces and trying to decide if shiny rocks counted as "reflective objects". That pushed the ritual campfire to start at about 9 pm. That's my bedtime and I couldn't keep my eyes open another minute. So I sent Zach off to the campfire and went to sleep. I don't remember Zach coming back to the tent, but by morning he had pushed me off the mattress. I had to crawl over him to sleep a little more on the other side. We had breakfast (Cheerios and banana and grapes) and then I struck camp while Zach and his friends took turns seeing how high they could get a kid to swing in a hammock. Finally, it was time to go. The car started, to my relief. We drove a mile or two back on the dirt road, until another vehicle passed us in the opposite direction and a dirt cloud engulfed us. Immediately, our engine began sputtering. I couldn't get the SUV to exceed 20 miles an hour. If we can only make it to the highway, I thought. I explained to Zach that we had ten miles to go, and at 20 miles an hour it would take us a half-hour. "How long would it take at 60 miles an hour?" he asked. I explained that Papa can't do math when the engine isn't working right, and anyway it would be too dangerous to try and drive an unpaved road like this at 60 miles per hour. "Why don't you do what you did before?" he asked. I explained that I hadn't really done anything, just looked at the air filter and that it was almost certainly a coincidence that the car then started. So we labored along, being passed by people we didn't know. 15 miles an hour, then 10. Slower up hills. Finally, with a truck and a trailer behind us, we came to a stop and the engine stalled. The truck pulled up alongside, the passenger rolling down her window and asking if we were having trouble. The driver got out, looking like he knew all about engines. Which is to say, he was a good-looking, thirty-something straight guy. While explaining the symptoms, I opened the hood and unlatched the air filter just to show how clean it was. By now another guy had stopped and remarked that "black smoke" had been coming out of my car when it was running. The two of them decided the problem had to do with not getting enough air to the engine—perhaps related to our elevation, which at the Rim is almost a mile higher than in Phoenix—exacerbated by my driving so slowly along the dirt road. I tried turning the key, and the engine roared to life. "That's it!" one of the guys said. "Now, don't go slow—go! Get to the highway as fast as you can!" I took him at his word, racing around curves, passing an RV through a solid wall of dust, desperate to get to the highway before the car stalled again. "I thought you said it would be dangerous to drive at 60 miles an hour on this road," Zach remarked at one point. "Shut up and hold on!" We made it, obviously; and the car continued to work properly once on the highway and all the way back home, although the "CHECK ENGINE SOON!" light is now glowing. So, now I've got that to contend with. However, fortunately, that little incident did not mar our camping trip. We couldn't have had more fun, and are already looking forward to the next one. After I get the car fixed.